At first I wasn’t going to write this article. But the material begs to be shared. I can't help myself. 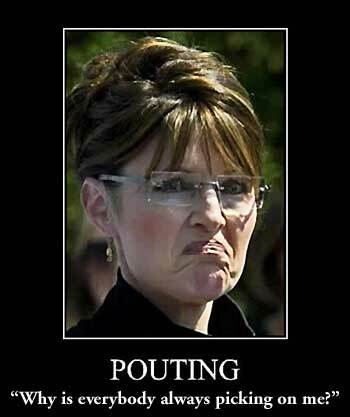 So if you admire Sarah Palin, stop here. Go to the Index and pick a topic you haven't read on this blog. What fired me up is this continuing babble about what a wonderful person she is, while overlooking her lack of character and an anemic resume! She quit her job as Governor of Alaska, after serving only 1 year and 10 months. For gawds sake, she barely dipped her toes in the water. In no way does that count for a damn thing! She recently stopped over in the Tri-Cities area of southeastern Washington; Richland-Kennewick-Pasco. 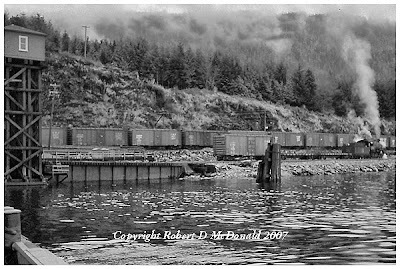 Richland probably being the most recognizable name to my readers around the world as being the location where bomb grade plutonium was refined that ended WW II. Her husband Todd is not with her, deciding it would be more stimulating to stay home and repair the family roof. Great timing. Lets fix the roof at Thanksgiving. I think it was a convenient excuse on his part not to be seen with her. Anyway, as part of her Sarah Doll presence, she entered the local Red Cross “Turkey Trot.” (“Turkey Trot!” Get it? This is like shooting fish in a barrel!) A large crowd had gathered at the finish line to get autographs and a giggle fix. But she never finished the race! She peeled off before getting to the finish line to go to her turkey dinner! 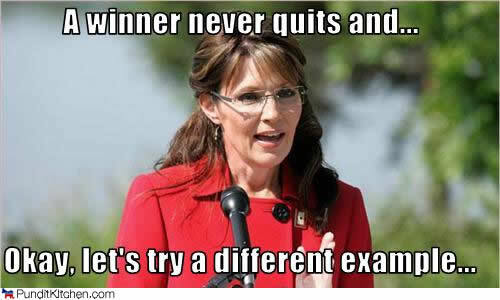 Sarah – being Sarah – had a convenient explanation. She didn’t want to create a crowd control problem for law enforcement. Since when did a politician want to avoid a crowd? 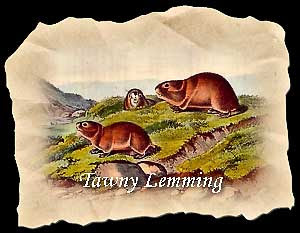 The Lemmings, being Lemmings, were very forgiving and understanding of her. “She is one of us” proclaimed one of her glassy-eyed supporters. Much has been said about the Lemmings queuing up to get their books autographed. I would venture to speculate that fully 30% of those waiting to get the book signed are not there for Sarah, but plan on making a mint off that book when they put it on eBay! 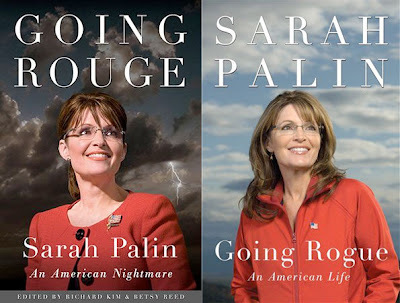 If you intend to buy her book, make sure you get the “right” one! In my last sound off, I asked if you had looked up the word “rogue” in the Merriam-Webster on line dictionary. Which definition did you decide best describes her? Number one? Or number two? The Lemmings gave us King George (Bush.) And now they are anxious to offer us Queen Sarah. Things have been pretty slow in the yard here in Port Townsend this fall. I was out yesterday during a lull in our string of low fronts, and found this raving beauty on the chocks. The M/V Northwind is a 79 year old 130 foot motor yacht! Still getting used to all the manual controls on my new digital camera. I am relearning the creative challenge of taking full control of the exposure, right down to processing the RAW format "digital negative." The difference between a RAW image (RAW means nothing but "raw" ) and a normal camera image is that instead of depending on the camera's internal computer to process a .jpg image, RAW yields the equivalent of a film negative. to create my final image. All the fun I used to have in the dark room a century ago! 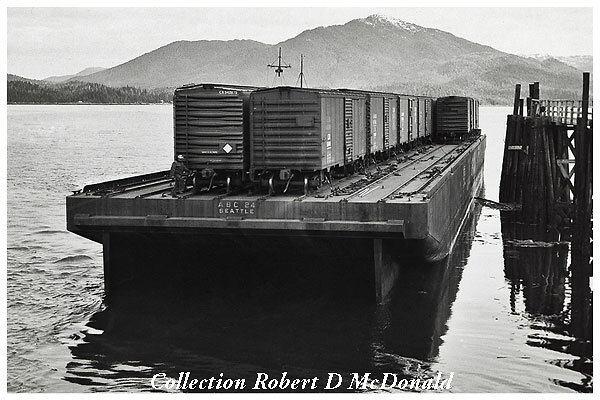 My first "major shoot" was the photography for the two part Alaska Railbelt Marine article. Shooting in the RAW does have the drawback of being more time consuming to realize a final print. However, one thing I have plenty of, is time! 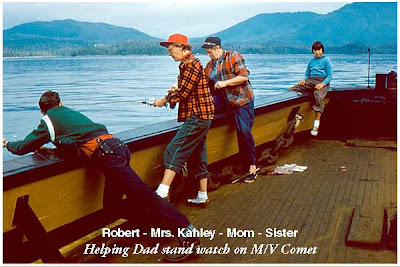 Because I have such control over the final .jpg photo, I wanted a more accurate monitor. 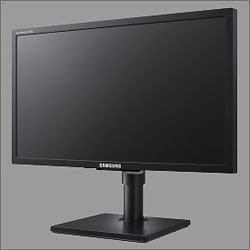 I replaced my TFT analog monitor with a cPVA digital monitor. cPVA technology yields more accurate image performance and professional-caliber color, with 100% support of the sRGB color mode. 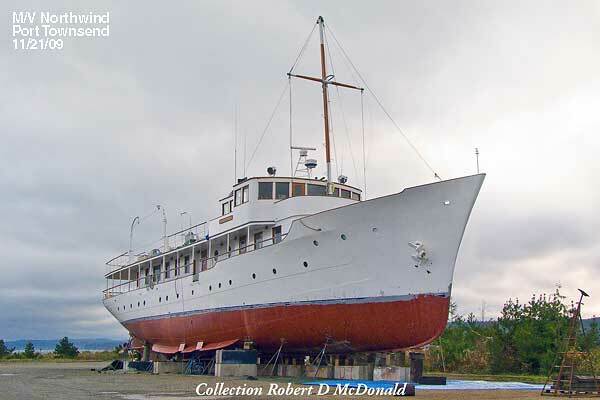 The M/V Northwind apparently has no owner, being listed by a broker. 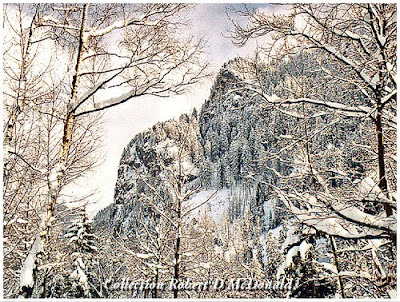 After the war ended, it is said that Winston Churchill used her as a refuge to relax and paint. 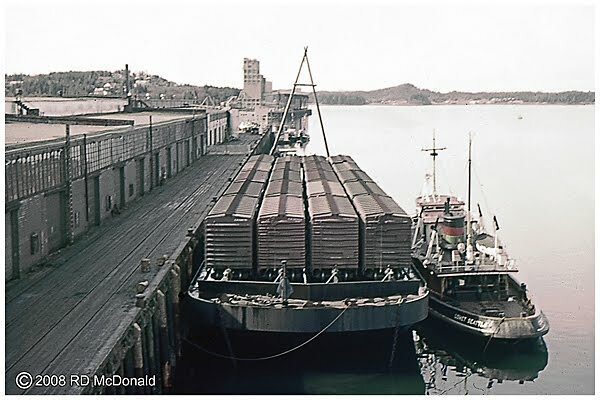 She was built in 1930. Here is her interesting story. Canadian National Railways, Prince Rupert, October 1957. 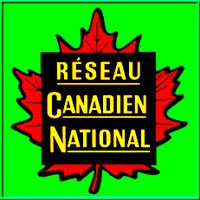 In my previous entry, I tell of the “Winds of Change” crossing Canada. 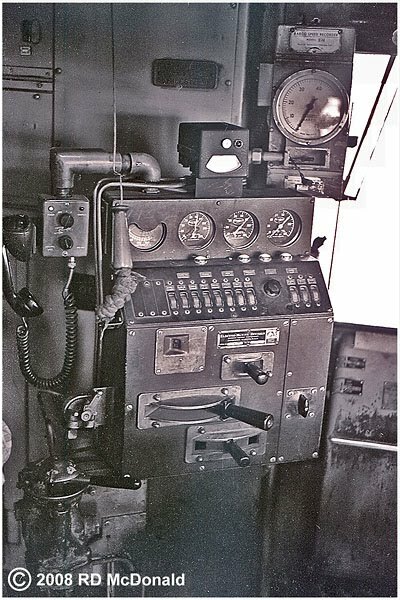 Highly accomplished steam locomotive engineers found themselves sitting in a locomotive cab with valves and gauges replaced by switches and meters. 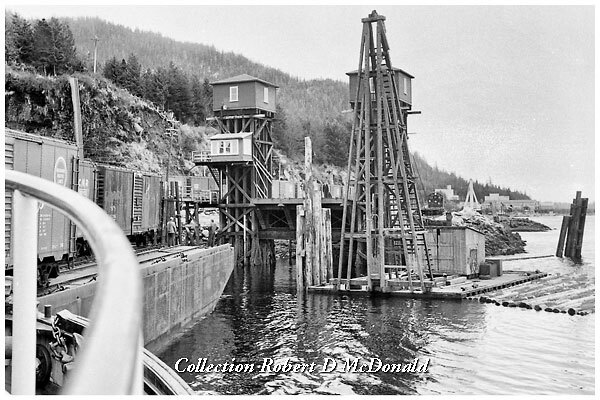 When we arrived in Prince Rupert in late 1957, the process of replacing steam power was just about completed. Steam had been pulled from all road freight operations. The scene at the engine servicing facility tells the story better than words. 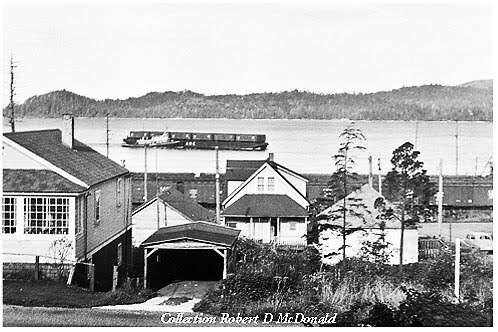 Here we see CNR 5152, the last of the 4-6-2 class running the varnish out of Prince Rupert, flanked by a GP-9L 4208 and a “B” unit that will handle the evening time freight, and the 7242, an SW-900, which had recently given the pink slip to the 7536, a 0-6-0 yard goat. Another transition issue: Fuel. 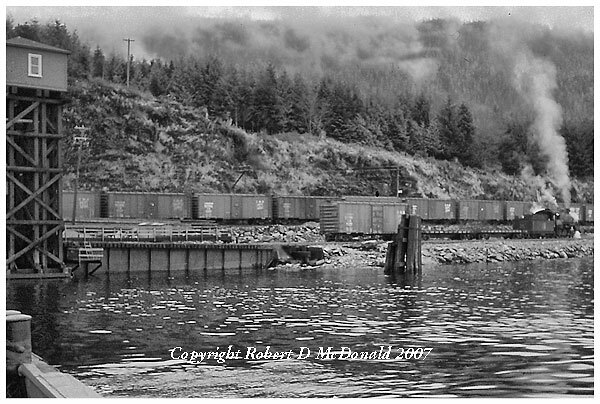 Tank cars carried oil for the remaining steam, passenger only, while newly installed tanks, just off camera, store diesel fuel. 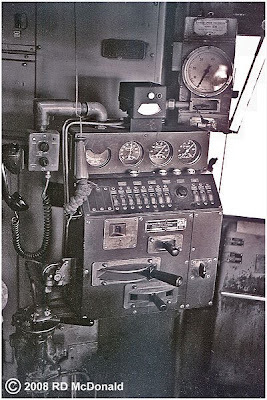 And a Mechanical Instruction Car was parked next to the station, with engine crews and maintenance workers learning about amperes, short time ratings, flash-over and dynamic braking. 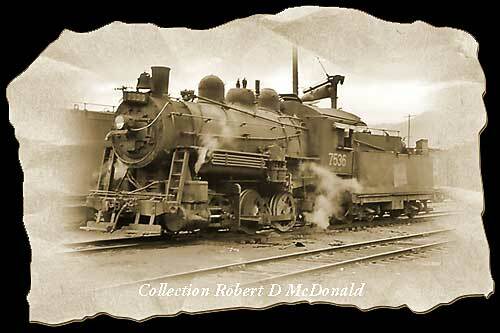 You know, when you get to thinking about it, there were earlier changes imposed on steam locomotive engine crews. Remember? Back as early as 1895, when the Baltimore & Ohio began experimenting with electric locomotives. 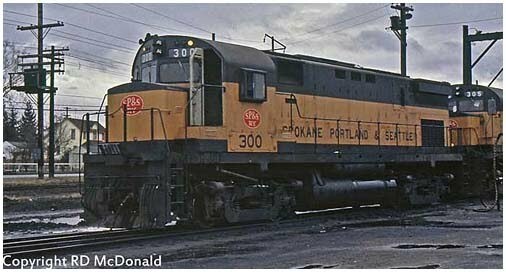 For many years, big name railroads ran electric locomotives for one reason or another. 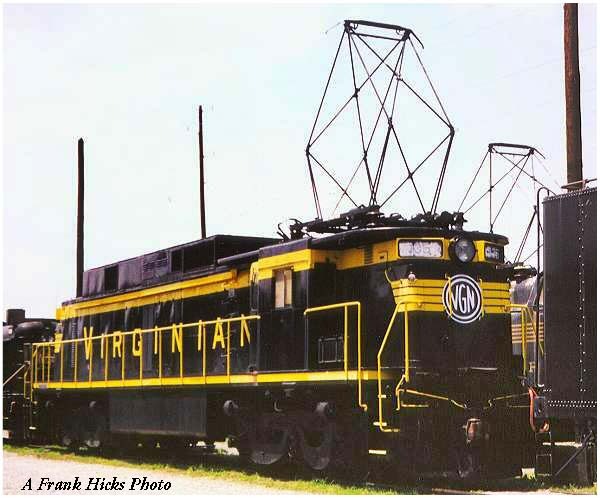 Remember the high tech Ignitron-Rectifier electrics that the Virginian ran? And how about the GG-1’s. I found a very interesting document concerning the remaking of a Milwaukee Road steam locomotive engineer into an electric locomotive engineer, written by W.F. 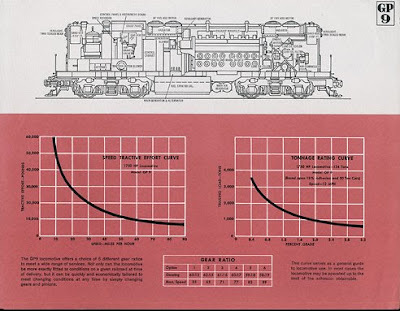 Coors, a traction engineer with General Electric. He talks about everything from the engineers image of being a "motorman" to road assignments. His observations were published in an article that appeared in the September 1917 edition of the General Electric Review. Highly recommended reading, especially for "students of the Road." 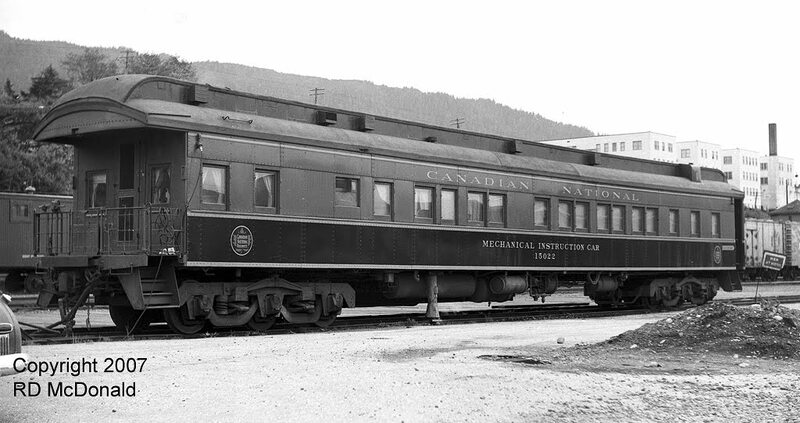 Canadian National Railways 4203, Prince Rupert BC, October 5, 1957. The winds of change are blowing in the air. Where once a sturdy Pacific 4-6-2 would have patiently waited with whining steam generator, thumping air pumps and smell of wet steam, to fill her sand boxes, a freshly painted General Purpose dash nine sits. 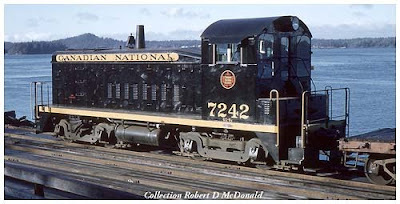 General Motors Division has already wiped out the last of Canadian National Railways steam freight locomotives. Many sit on a dead line up at Jasper, awaiting their fate. It’s an uncomfortable time as the diesels move in, looking every bit as awkward and self-conscious as seen here at the sanding tower. This unit is one of the first six in Canadian National’s initial order of the General Purpose (GP) 9 series road switchers. 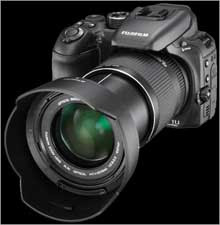 As the name implies, the GP design is ingenious in its simplicity. About as utilitarian as it gets; a stark steel box covering the power supply, providing open walkways for visibility fore and aft. 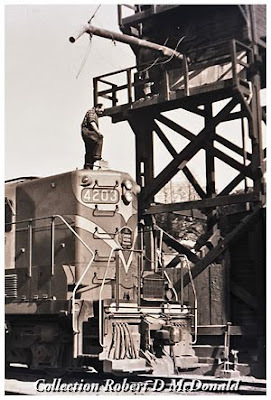 And stringing them together like beads on a thread, blocks of horsepower can be created to handle any assignment, from time freights, to varnish, to local switching duties, with equal aplomb. I remember very clearly the smell of fresh paint on this unit. While she was built in 1956, she was renumber from 4499 less than a month before I shot this photo. Probably her first trip on the Prince Rupert Extension since her renumbering. As a matter of fact, I was onto the renumbering the day I shot this photograph. With the sun glancing off the cab at just the right angle, her original number, 4499 was clearly visible! 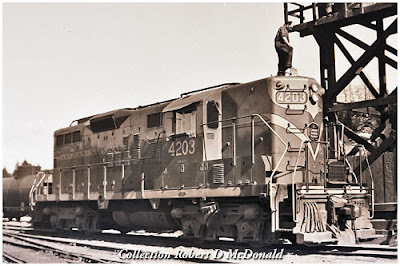 Canadian National Railways 4203, nee 4499, built by General Motors Division, London Ontario, as a 1,750 hp GP-9L, November 1956, Serial Number A-1017. 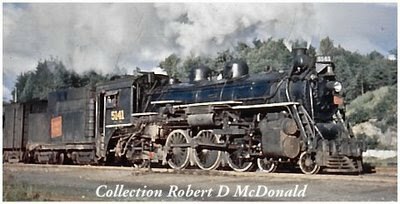 Re-numbered 4203 September 5, 1957. Flexicoil trucks replaced with Bloomberg trucks and renumbered back to original number, 4499, October 30, 1962. In 1986, taken to St Charles Shops and reduced to a daughter yard slug, CN 219, assigned to a mother CN 7200 series. Kicking Horse Pass, BC. Don't you feel bad when you miss someone's birthday? We certainly missed a big one last month! 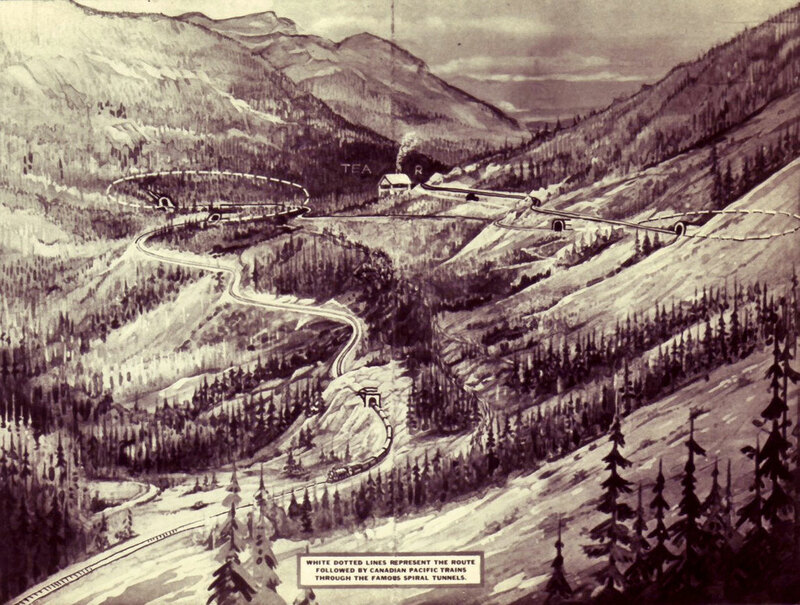 The 100th anniversary of Canadian Pacific's most challenging achievement, the "Spiral Tunnels" beneath the Canadian Rockies. 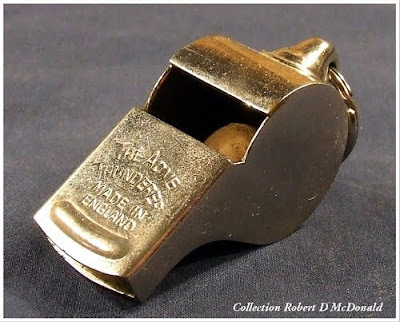 Often overlooked by Yankee rail fans, perhaps due to it's remote location. 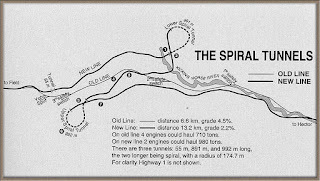 Nonetheless, the Spiral Tunnels ranks amongst railroads greatest engineering feats. 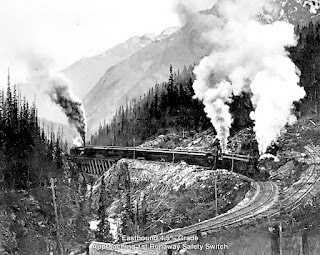 Back in 1871, when British Columbia became a legitimate entity, one provision that had to be met was the completion of a transcontinental railroad linking BC to the east. 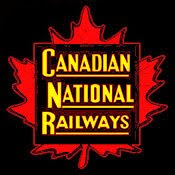 Canadian Pacific rose to the challenge, and in 1884, the last spike was driven uniting the Confederation. However. There was a Big Problem. 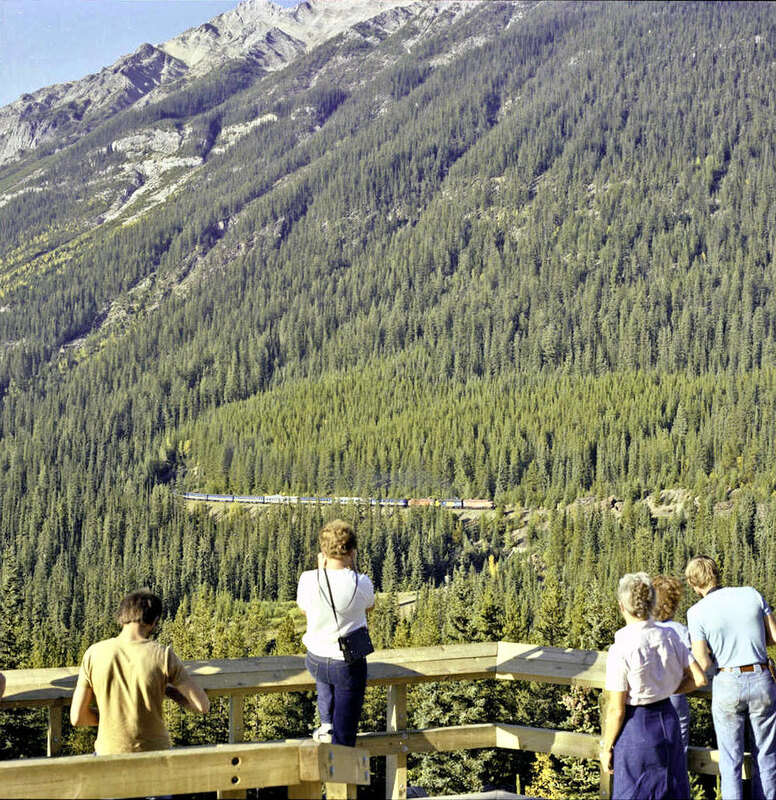 The Big Hill in the Canadian Rockies, with a gradient reaching a wheel spinning 4.5% up in Kicking Horse Pass. Not only was it a dangerous challenge to climb, the descent was worse. 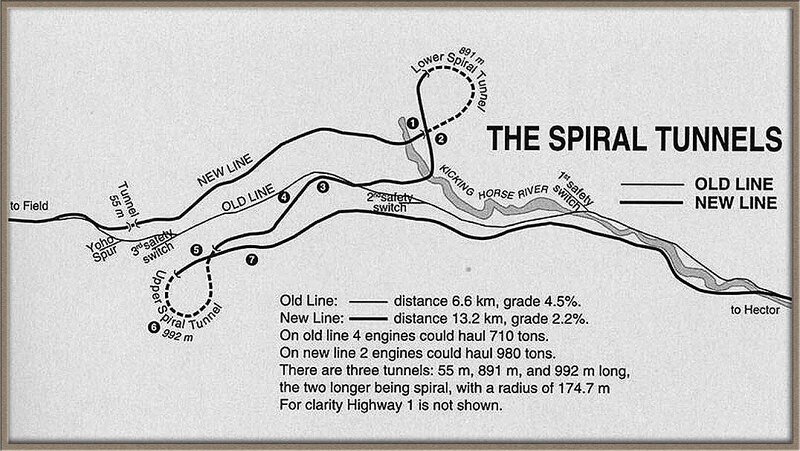 The solution was monumental, and and in 1909, the Spiral Tunnel route was opened. 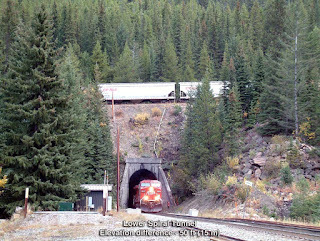 Last month, the achievement was celebrated with a special train through the tunnels. 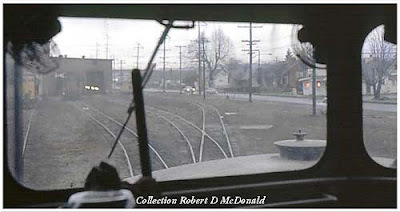 I would encourage you to "click" on my associates button in the right hand margin, "Canadian Railway Observations," and select the October, 2009 edition. Cor Van Steenis submitted an excellent report on the engineering solution and centennial train. 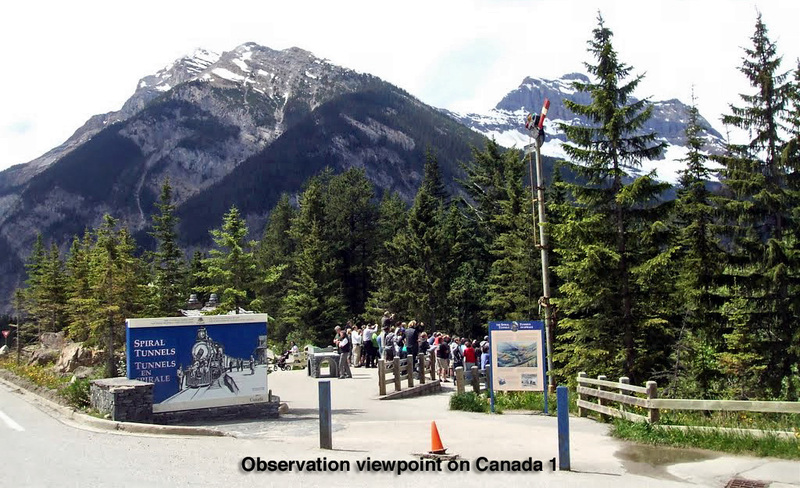 There are two viewpoints where you can safely watch trains and learn more about the Spiral Tunnels and Kicking Horse Pass National Historic Site of Canada. 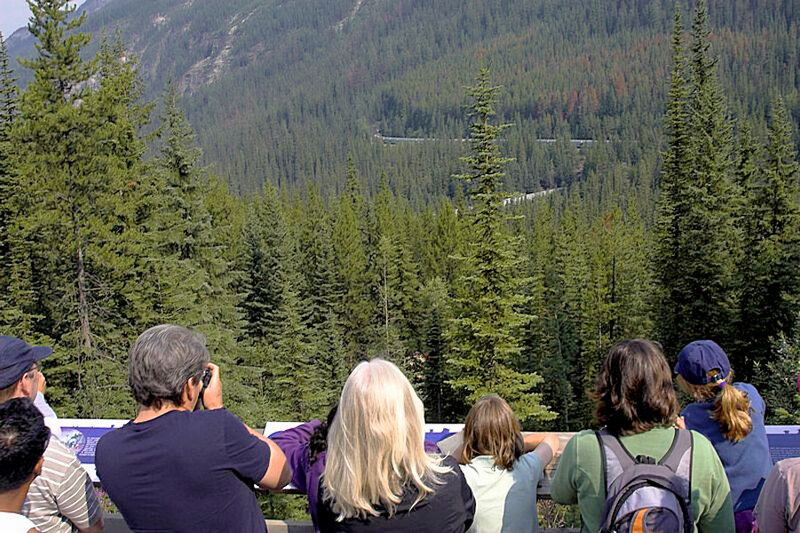 • From the viewpoint 7.4 km east of Field on the Trans-Canada Highway, you can see the Lower Spiral Tunnel in Mt. Ogden. 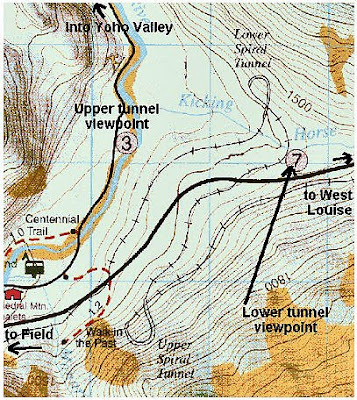 • The Upper Spiral Tunnel in Cathedral Mountain can be seen from the pull-off 2.3 km up the Yoho Valley Road. The cab shot is locked down, with few distracting mickey mouse shots. And an unexpected stall yields some nail biting moments as the hogger does a great job of restarting his train on grade, minus a power pack! 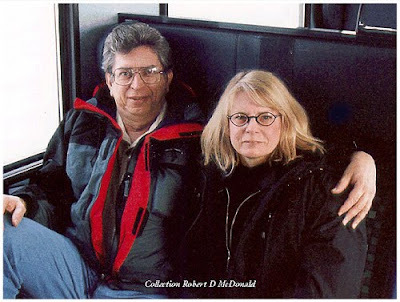 In February 1999, my lady friend and I embarked on a 14 day business trip to Munich (Munchen), Paris and London. Up to that time, I'd never had an interest in visiting Europe. 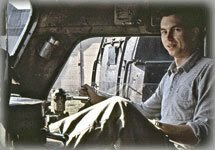 But much to my surprise, as our Boeing 777 descended on final approach into Munich, I was suddenly overwhelmed when I realized the history of man that had played out on the land beneath our aircraft. We traveled in February. While that was dictated by the business we had to attend to, it turned out to be a blessing in disguise. 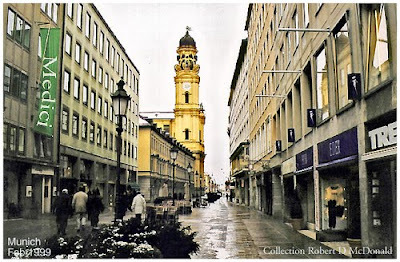 We had light snow flurries the entire time we stayed in Munich. 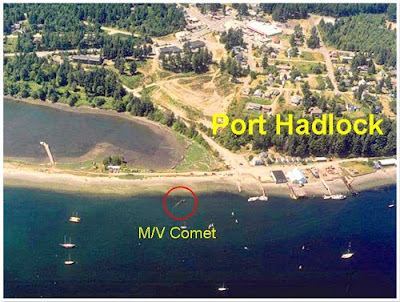 It really added to the beauty and ambiance of the area. 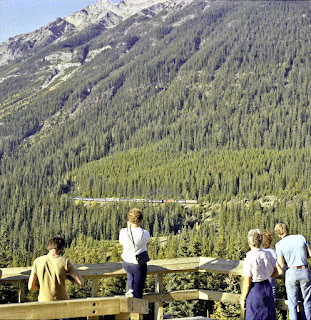 And being a “shoulder” travel period, we didn’t have to compete with the crowds found during “peak” travel time. 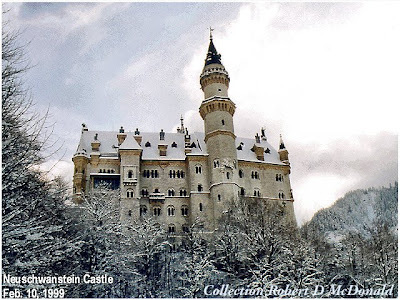 We took a day trip to Füssen to see Neuschwanstein Castle. The complete Deutsche Bahn (DB) railroad schedule is a thick as a big city phone book! This route map is for just the Bavarian District! 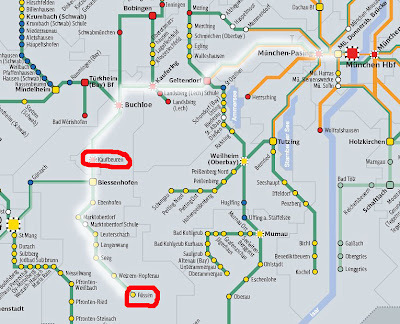 Munich is the bright red dot in lower center of map. [Use the "+" icon to enlarge map.] Many trains operate in a “push-pull” mode, and this particular locomotive is the “pusher” on the first leg of our day trip to Upper Bavaria. 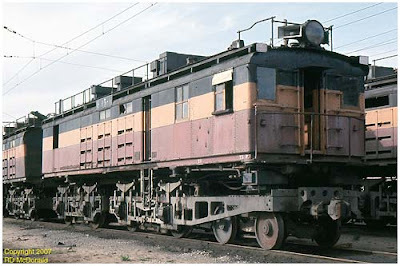 Can anyone on the Continent id this type of locomotive for me? 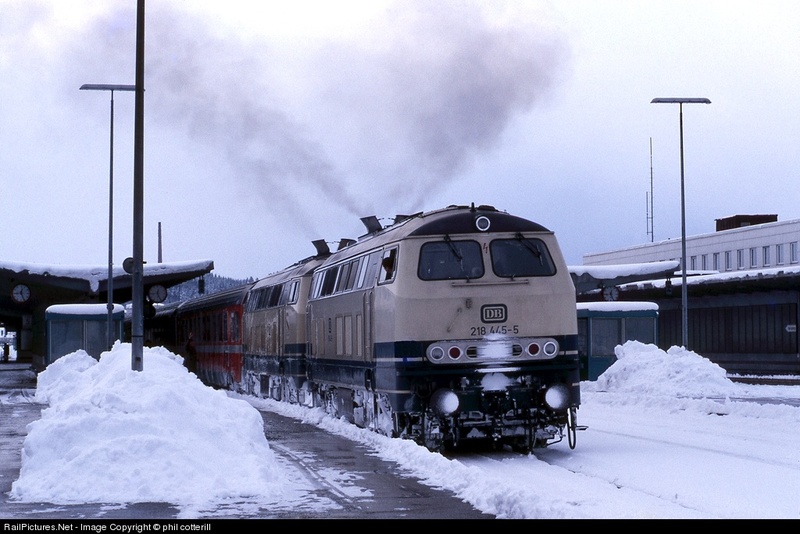 We had a six-minute train change at Kaufbeuren. 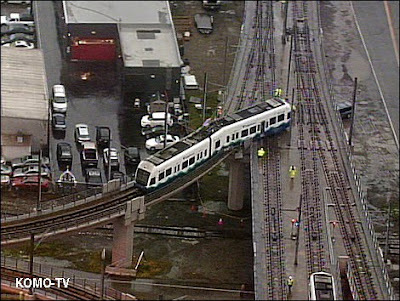 Once again, precision is remarkable. Looking across the platform, our connecting train was arriving and slowing down to a stop in near perfect synchronization to ours. 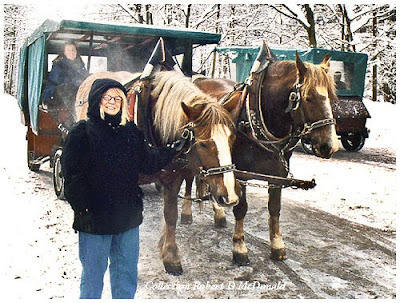 From Füssen we made the final leg up to Neuschwanstein Castle in a two horsepower wagon! 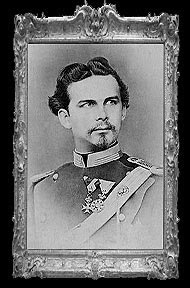 I could write several pages describing Ludwig II, King of Bavaria's Castle. 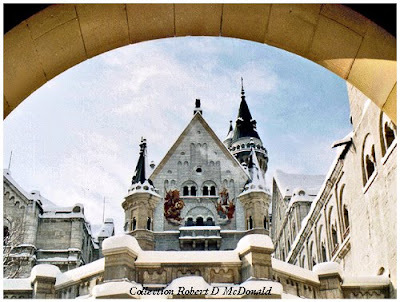 Neuschwanstein Castle is best known to American children as being the castle Walt Disney used as a model for his theme park castles. If you get a chance to go to Europe, make sure you build in a trip to Bavaria. I wish we could have had a month to explore more. One day was just a tease. 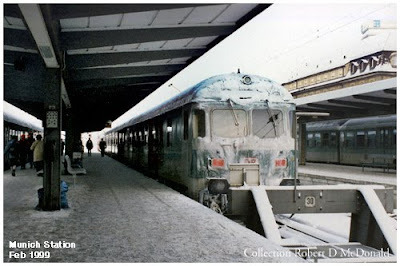 We had planned a high-speed overnight train to Milano, but rail strikes were popping up all over, and we couldn’t take the chance on getting stranded. Station Füssen. 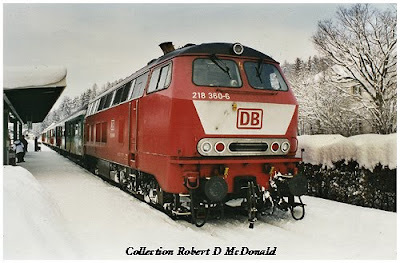 This clean Class 218, V160 motor family Bo-Bo, 2,467 hp diesel-hydraulic, had powered our train up from Kaufbeuren. These units have the nickname “rabbit” because of the angular twin exhaust stacks. Only one “ear” is visible in this shot. 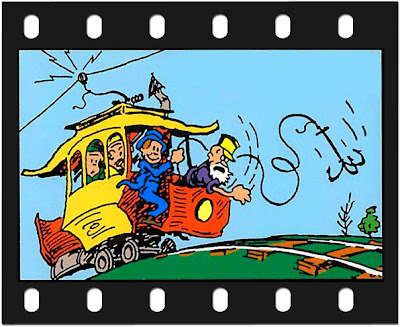 The “thunder bolt” between windscreens warn maintenance personnel of the potential danger of overhead wires. There is an odd grab handle; how do you get there? And what are the "flag" like thingies on the nose? I compared my German experience to my knowledge of the Coast Starlight service between Vancouver (WA) and Seattle. 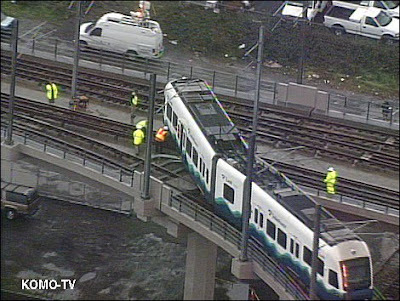 The Coast Start-late, in one study period from October 2005 through August 2006, delivered its passengers on time only 2% of the time, with trains consistently running 5 to 11 hours behind schedule. Apparently, the outlook for the future is just as grim.